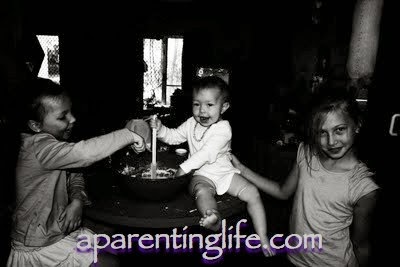 A Parenting Life: Did someone say pancakes? On a weekday? Now before I get started I feel that I need to offer a bit of a disclosure. You see I feel that I have already written this post but I just can't seem to find it. Which perhaps means that my feeling is wrong. Maybe I didn't write it I just though really long and hard about it. Stranger things have happened I know. Of course if the Blogger search box widget was working properly I would be able to have a really good look and know for sure one way or another but sadly that is not the case. In fact the Blogger search is so useless that I have removed it from the side bar. Which is more than just a little frustrating but what can you do? I fear I was the only one that ever really used it anyway so little sleep will be lost. it is however a super cute photo. Pancakes are one of our most loved breakfasts here. But then that is not really surprising. Who doesn't love a good pancake for breakfast? A better question might be who actually has time to cook pancakes in amongst the weekday morning hustle and bustle? Well put the mixer down and hold the phone because have I got the best news for you. Cooked pancakes can be frozen and then simple zapped in the microwave as needed. I was totally gobsmacked when I first read about it. In fact I went and whipped up a batch right away, stuck them in the freezer and gave it a go. And then when I discovered that it was true I felt like my life had changed forever. So much so that I was certain I went and blogged about it right away but apparently not. Anyway I am sharing the news now and that is all that matters. And in case you don't have a fail safe pancake recipe I am going to share mine with you. Get the electric mixer and mix it all together until you have a lovely smooth batter. If you wish you can sift flour, pre beat eggs and milk and then add gradually but experience has taught me that at the end of the day it makes little difference other than mixing for a bit longer. Heat pan with some butter and oil in the bottom. Tip excess oil and butter into glass jar to be reused between each batch. Spoon desired amount of batter into pan and cook until little bubble appear. The bubble indicate it is time to turn. Flip and cook until golden brown on both sides. Repeat until batter is all gone. Serve with your favourite toppings, ours include maple syrup, sugar & lemon, honey (& lemon), fresh fruit, yogurt, nutella and on some days even ice cream and chocolate sauce. Whatever doesn't get eaten layer between baking paper and whack in the freezer till you next want pancakes. Even on a school day. * I feel it would be remiss of me not to say that I rarely actually measure the quantities used I think this is about what I would use. If it is too thick add more milk, too runny add more flour. The apple can be optional as well if you leave it out put in a little more sugar. yes to get enough for the freezer I have to cook a super big batch or when no one is around!